The audience is budget conscious and looking for product efficiency and innovation. Water conservation and utilizing environmentally friendly equipment is important while working to keep water systems healthy. 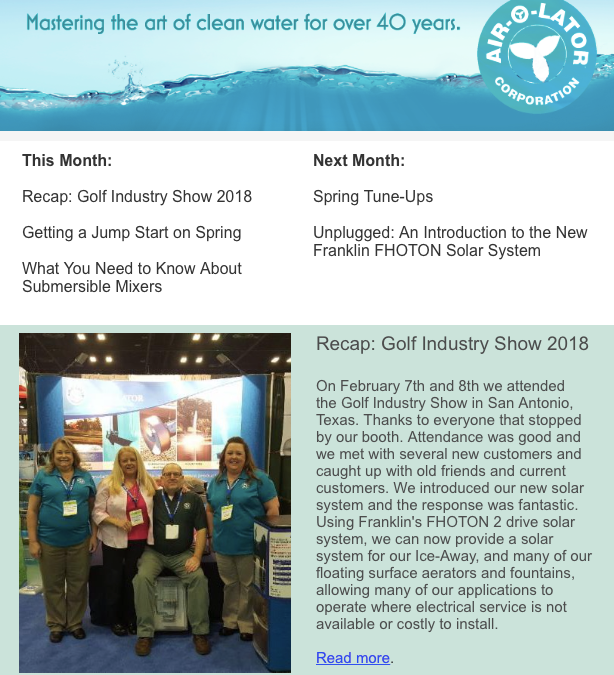 Reading trade magazines, attending trade shows and searching websites are the top three ways the audience stays abreast of equipment, resources and industry news. The goal of the Airolator Email Campaign is to nurture an ongoing relationship with Air-O-Lator customers with engaging monthly email newsletter content that educates readers about recent Air-O-Lator news, developments, and thought leadership, as well as sales and conferences. Total unique opens increased by 12% in the 2017 year during the Air-O-Lator monthly email campaign. Mobile opens increased by 17%. And bounce rate decreased by 30%. Give us the whopper of a result that stands out among all other metrics you tracked. Bounce rate decreased by 30%. This is a big deal because the content in Air-O-Lator’s monthly emails is often technical and industry driven. A 30% decrease in bounce rate means that our readers were interested in the content we were producing.